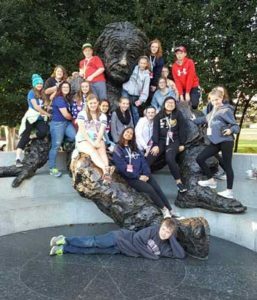 An extended trip to Washington, D.C. Oct. 21-23 left 20 Templeton Middle School students and two teachers with unforgettable experiences. The school group visited Mount Vernon, U.S. Capitol, Library of Congress, National Archives, Ford’s Theater, Holocaust Museum, several Smithsonian museums including the National Museum of African American History and Culture, Arlington Cemetery, U. S. Supreme Court and many of the war memorials, including the Lincoln, Jefferson, Martin Luther King, Jr., Roosevelt, Korean, Vietnam and Iwo Jima. The eighth grade students participating in the field trip included: Grace Butscher, Adriana Clark, Andrew Dow, Sonia Estrada, Margaret Flynn, Mackenzie Hietpas, Jenna Holler, Leah Jurgenson, Isaiaha Latimer, Abigale Lemke, Thy Nguyen, Maggie Olejnik, Grace Pagel, Elizabeth Prell, Arushi Ranasaria, Isabella Sanchez, Isabelle Stefanovich, McKinley Towne, Benjamin Wieseckel and Nadia Yakich. The teacher chaperones were Alan Schneider and Rhonda Watton.